This box has been painted by Fedoskino artist Marie Galyamina. This traditional for Fedoskino School composition shows a woman with a Yoke. Its original was painted by the famous Russian artist I.I. Sokolov; and the same scene can be found in almost every catalogue on Fedoskino Lacquer Art. The depiction of Ukranian peasant life, during the Vishnyakov and Lukutin era, was extremely popular after the smashing success of Gogol's "Ukrainian Tales". In the 1860s V. Timm published I.I. Sokolov's drawings dealing with Ukrainian peasant life in his Russian Art Newspaper (Russky Khudozhestvenny Listok); and very soon the Ukrainian Woman theme borrowed from lithographs published in this newspaper became very popular among artists of the Moscow region. 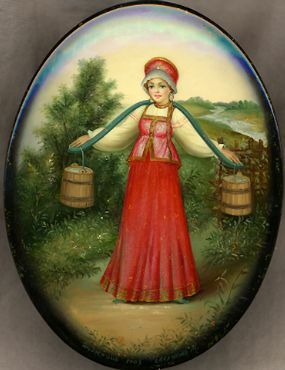 This composition showing a Ukrainian or Russian woman with a Yoke. The young girl, dressed in traditional peasant costume, is depicted by a riverside on the outskirts of a village against a light silverish background. This delicate landscape creates a naively pure image, whose lyricism is akin to the generalizing symbols redolent of folk art. The scene is painted in bright, mellow tones. Aluminum powder is used here to enhance the color of the river, the buckets,and the girl's skirt. More over, aluminum powder makes the composition look more appealing and decorative, and fills it with a magic glow. The box is made out of paper-mache. The mixture of green color and aluminum powder covers the exterior and red lacquer covers the interior of the box. The lid isn't hinged and the box rests on the four small round legs. Signed with the name of the artist, village and year (2003).